"It has been amazing," declared director of Scarborough's annual Books by the Beach Heather French. "The festival was launched to a big crowd by Egyptologist Professor Jo Fletcher. Jo was on top form and the bar was set high," she said. "Throughout the next four days audiences were treated to a wealth of fiction, science, history, music, cricket, and politics." Yeoman warder Chris Skaife from The Tower of London was, for Heather, a personal highlight of the literature festival. As Ravenmaster he spoke about his life with the birds and gave a fascinating peep into the Tower’s heritage. "TV and radio gardener Jim Buttress spoke for 6O minutes without a single note and had us all in stitches," said Heather. 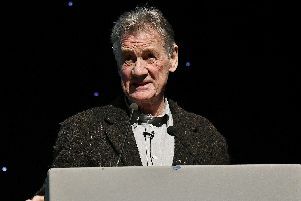 "The Sunday finale was Michael Palin at the Spa Grand Hall. Michael was a warm and enthusiastic storyteller who took us on atale of polar exploration and had the longest queue for book-signing I’ve ever seen," she said. Heather thanked the authors and hosts, sponsors, patron Helen Boaden and her volunteers. "But most of all I'd like to thank our lively audiences who have supported me to deliver a sixth festival," said Heather. Next year's Books by the Beach will run from Friday April 24 to Sunday April 26.